A movie that has a pretty basic plot, but is actually quite funny in the way it finds the right beats and gives us some pretty humorous characters. 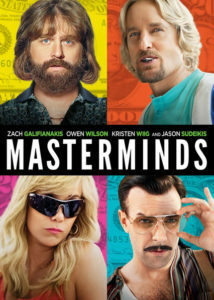 Masterminds may look like a pretty simple film, (and as far as storyline goes, it is,) but this movie is definitely smart. It’s smart in the way it finds the right humor and way to hit its marks, and it’s also pretty smart in its casting. This movie has cast more Saturday Night Live veterans than anything around. From Kristin Wiig to Jason Sudeikis to Leslie Jones to Kate McKinnon, this one is pretty packed. And those stars are all natural performers who definitely know humor. On top of that, there’s Zack Galifanakus here as the star and Owen Wilson on hand for support. The cast definitely works in taking this average story and turning it into something pretty funny. It’s a movie about a heist being pulled off by a bunch of idiots and then watching them deal with the aftermath. We’ve definitely seen this sort of thing before, but at least with this movie, it’s a pretty funny take on the familiar. 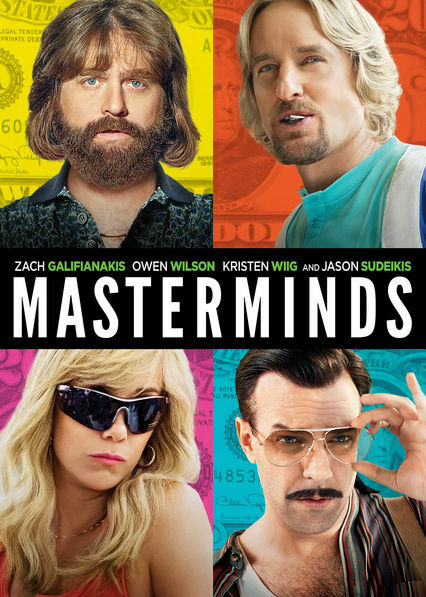 Masterminds is surprisingly a pretty funny and entertaining movie. The surprise is based on what looks like a routine cast and storyline. Nothing about this movie, from the trailers, says unique or special. And to be honest, it’s not. It is a movie about dim witted robbers. And we’ve seen that story many times before, (such as in the movie Welcome to Collinwood,) but this movie goes for pure, straight forward laughs. It doesn’t try to be smart or dark or anything like that. It’s just a basic, straight forward comedy and that actually goes a long way. And even when the plot runs pretty thin, or illogical, the laughs are still there. The reason to have doubt about this movie, more than anything else, is the cast. Zach Galifanakus hasn’t been good in anything he’s done since his breakout film about a decade ago, The Hangover. That movie was in 2009, and the two lousy sequels that followed it didn’t help. Since then, the movies he’s been in have been unfunny, dull, or both (It’s Kind of A Funny Story, Due Date, The Campaign.) Luckily Galifanakus does have the show “Between Two Ferns,” on Funny or Die, and that helps him stay in the spotlight with something that actually is funny. But with the movies, he’s been mostly giving us misses over the past decade, and that’s a pretty big problem when trying to instill faith in any upcoming film. And Galifanakus is the star of the show here. He’s never been the star. Not even in the Hangover. But maybe it’s just his time. After all, at the same time this movie came out, he had another movie where he was also the star, called Keeping Up With The Joneses. And with Masterminds, he’s surrounded by some pretty talented supporting players. Kristin Wiig is second billed here, and while she is also a hit and miss actress, her sense of comic timing is pretty impeccable. Wiig made Bridesmaids what it was, and was even able to add humor to the more depressing film, The Skeleton Twins. Its good to have her on board in this one. The movie also features Owen Wilson and Jason Sudeikis. The last time those two shared the screen together was in Hall Pass, and that movie was pretty awful. But Wilson has a built in body of work behind him that takes him back to his Wes Anderson movies, and that goes a long way. And there are also Kate McKinnon and Leslie Jones on hand here. That makes a hell of a lot of Saturday Night Live vets from Wiig to Sudeikis to McKinnon to Jones. The only non SNL members are Wilson and Galifanakus. Perhaps that’s another reason why the movie might have looked more like an SNL sketch than a feature film. But the storyline works, especially as seen and told through the eyes of our protagonist, David Ghantt (Galifanakus.) He drives an armored truck full of cash for a living, and at the start of the movie, his voice over narration is telling us why he chose this career. He wanted a life of adventure, like what he used to see in spy movies, and thought this career would lead him to it. He thought criminals would be trying to rob the armored truck and it would be up to him to stop them. Turns out when criminals do try, they can’t shoot through the truck and Ghantt simply drives off while the criminals end up running away. Not too exciting after all. And that’s where we pick up with David. He’s been at it with this career for a while, and his partner is Kelly (Wiig.) David’s got a massive crush on her despite also having a fiancé at home, (McKinnon,) waiting for him at the end of each day in their trailer. David dreams of a better life. His fiancé is both strange and annoying and on top of that, her mother lives with them in their tiny trailer, and she doesn’t exactly seem like the greatest house guest. There’s a funny sequence where Ghantt and his fiancé go for a photo shoot and end up doing some very strange poses. What we get from it, more than anything else, is that this woman annoys the hell out of Ghantt, and that he would love to have a way out of getting married to her. Well, he’s about to get one. Kelly quits her job and then gets convinced by her friend, Steve, to try and get Ghantt to rob the armored truck station, where all the money is waiting for pickup and delivery. And knowing that Ghantt is so into her, makes Kelly pretty sure she can get him to do it. So she calls him up, promising that afterwards, he can go down to Mexico, and she’ll come join him when things settle down, and they can be together. So of course he agrees. And they puts the robbery pieces in motion. The day of the robbery, everyone is there on the scene, with Ghantt in the building, robbing the place, and Kelly and Steve waiting in cars outside. Only things don’t go as smoothly as the characters all assumed they would. Ghantt is an absolute idiot who accidentally leaves a camera unsmashed, a VCR recording, and then has all sorts of problems with the getaway truck. It’s by far the funniest sequence in the movie. And it ends with a great car crash, and with the crew walking away with a lot of money. So Ghent heads down to Mexico, as planned, and is all ready to live the rest of his life in luxury and happiness. Only he stops hearing from Steve. And then he stops hearing from Kelly too. Eventually she does call him again, but it’s only to let him know that she was never really into him at all. He was their fall guy and now he’s taking the fall. And on top of that, Steve has hired a hit man (Sudeikis,) to go down to Mexico and take Ghantt out. And that’s where the movie starts to go downhill. Sudeikis is fine his role and there’s nothing wrong with the plot point of sending a hitman down to kill Ghantt. But the problem gets resolved by a hell of a coincidence that just feels very out of place and ridiculous. Let’s just say it involves characters having the same birthday and what that means. This twist or plot point in the story arc is so bad that it actually changes ones perception of the movie. Sure it was a good and funny film, but that ending doesn’t do the rest of the movie justice. And nothing really smart of creative comes after that either. The cast here is definitely giving it their all, and delivering on the comedy as much as possible. But that one single plot twist toward the end really throws things off. It’s funny how just one scene can make all the difference in the world. Masterminds is still a good movie, but it sure does get lost towards its end.